Uncompressed streaming of 3D video at 1080p from computer to TV up to 160 feet away. I didn’t know quite what to think of this product just from its description but once I saw it in action, I decided that I’m a Nyrius convert. I know it might sound funny to say it but I’ve wanted a product like this for a long time–at least for the past five years. 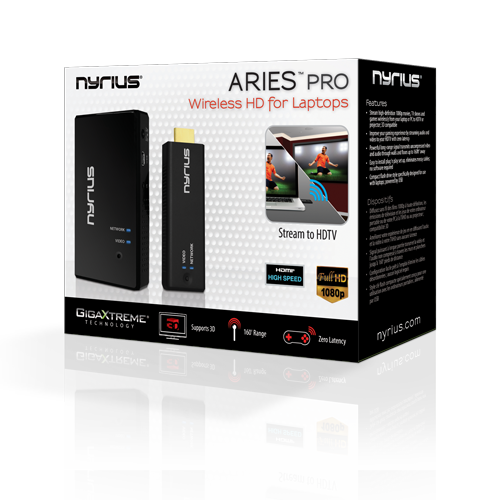 The Nyrius ARIES PRO Wireless HDMI Transmitter for Laptops consists of a wireless transmitter that you insert into a laptop (or other computer) via its USB and HDMI interfaces and an HDMI receiver that connects to your TV’s HDMI interface. The receiver also plugs into a power outlet. And as if by magic, the two units connect and your computer’s screen is streamed to your TV. Seriously. The reason that I’ve waited so long for this can be summed up in a single word: Netflix. Several years ago, we purchased a Netflix subscription from which we ordered physical DVD movies, three at a time, that were delivered to our home. After watching the movies, we returned them. 1. The Netflix Channel on our Nintendo Wii. 2. A laptop wired to our TV. 3. DVDs mailed to our house, which we also had to mail back. None of those options were/are that great. 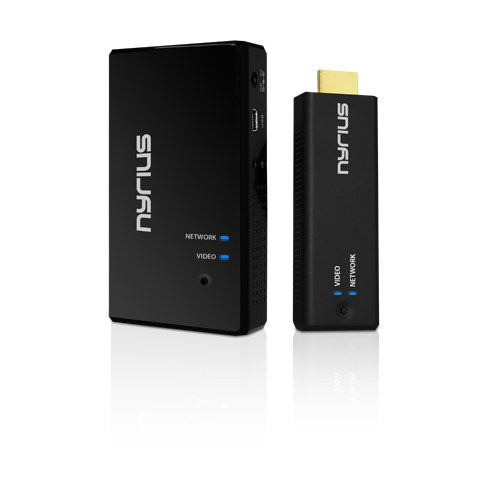 The Nyrius ARIES PRO Wireless HD Transmitter (ARIES PRO) takes care of that problem. But the service doesn’t just stop at Netflix. I can stream anything to the TV that I have on my laptop, which includes movies, TV shows, computer applications, presentations, and even Skype conversations. I used to have what was called a “TVator” that consisted of wires and hookups that worked very well back in the 1990s. It was very cool. A wireless setup would have been (And is) much better. For presentations, I’m not limited to where I am in a room. I don’t have to stand in some cumbersome place and have the people in the room shuffle around to see the screen. I’m totally out of the way. In fact, I don’t even have to be in the room. I could be at my desk giving the presentation to the conference room up to 160 feet away. That’s handy for when I need to record a presentation as well as present one at the same time. Being able to do it remotely cuts down on all of the ambient room noise: coughing, shuffling, random comments, etc. Now, I understand that this product is meant for streaming TV, movies, and video games from your computer to a TV screen but come on, that’s way too limiting for someone who needs this product for less esoteric use. 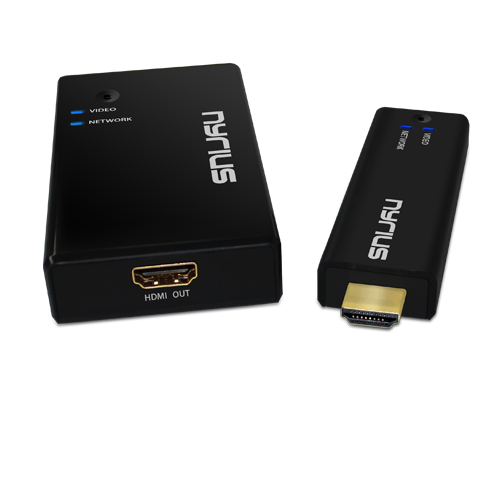 Why it’s frugal: The ARIES PRO product is frugal because of its flexibility as a streaming device. If you could only use it as a computer to TV connection for games and movies, it wouldn’t be frugal. But its extended use as a professional presentation tool makes it extremely frugal. You don’t have to buy anything else. Plug in the HDMI cable and power connector to the TV receiver box (the larger one) and then connect that box to your TV and power. Change your TV channel to use the HDMI port that you plugged the receiver into. Connect the USB cable to the transmitter and then plug in the transmitter to your computer’s HDMI interface and into an open USB interface. The two units “find” each other and begin transmitting. If this doesn’t happen automatically, press the button on the transmitter once. Everything that is now on your computer screen is mirrored on your TV. Magic. There’s no software to install, no messing around in Control Panel, no calling your brother-in-law the computer expert to help you figure it out. It just works. The downside of a product like this for home use is that now there are Roku boxes, Chromecast devices, and Apple TV, for streaming movies and TV shows that the need for such a device has diminished somewhat. However, the need for this service has exploded in businesses for training, presentations, software demonstrations, and collaboration. No conference room should be without one. And while $250 for a home setup is a little steep, it’s a great deal for businesses. I guess the old adage is true for the ARIES PRO–when one door closes, another one opens. For quick, easy setup for conference room computer visualization, I haven’t seen anything better since the TVator. It’s a quality product at a great price point for business use. Recommendation: Buy it for your business but you probably don’t need it at home.